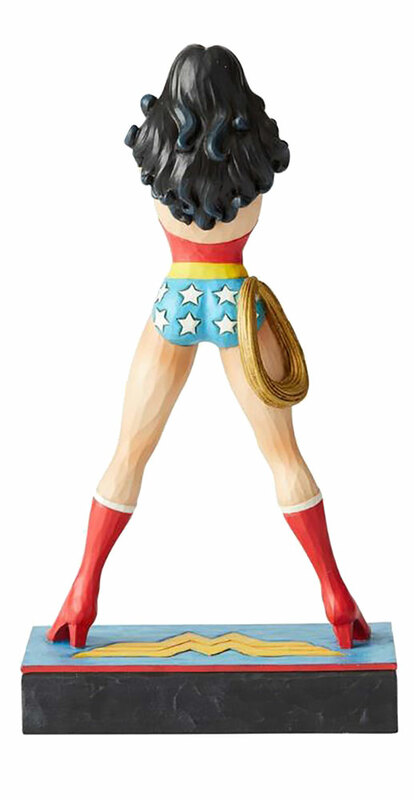 Renowned folk artist Jim Shore brings the Silver Age heroes of DC Comics to life with the DC Comics by Jim Shore figurine collection from Enesco! Build a Justice League of your own with figures of Aquaman, the King of the Seven Seas (10 tall with trident); Batman, the Dark Knight Detective (8¾ tall); The Flash, the Scarlet Speedster (7 tall); Green Lantern, the Emerald Gladiator (8¼ tall); Superman, the Man of Steel (8½ tall); and Wonder Woman, the Amazonian Princess (8½ tall). Each figurine comes atop a themed base with the hero's iconic logo, and the figure itself features the classic Silver Age style. Each figure is made of polyresin and calcium carbonate.